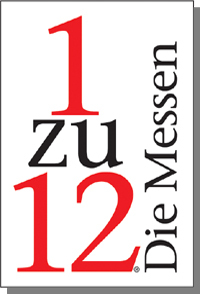 1zu12 - Das Magazin, Barbara Leuchtenberger, Marblicksweg 67, 59555 Lippstadt, Germany; Tel. +49 (0)2941 810980, Fax. +49 (0)2941 810982, e-mail: info@1zu12.com, Internet: www.1zu12.com - The German miniatures' magazine. 64tnt miniatures, Loredana Tonetti, Via Matteotti 12, 24060 Spinone al Lago, Italy; e-mail: loredana.tonetti@libero.it, Internet: www.facebook.com/64tntminiatures - Original and unique fantasy accessories and furniture, teapots, fruits and cakes. Aat Oukes Miniaturen, Aat Oukes, Acacialaan 13, 3951 XR Maarn, The Netherlands; Tel. +31 (0)343441967, e-mail: aatoukes@planet.nl - enameled kitchenware and useful things for the household, filled cupboards, dolls and babies, baby clothes. Sink with working pump. NEU: Andrea Coppi's Minikreationen, Andrea Coppi, Landshuter Str. 74, 93053 Regensburg, Germany; Tel. +49 (0)941 93084737, e-mail: info@minikreationen.de - DIY kits for dollhouses and shops in various scales, modelised and turned unique pieces and handmade miniature bears, stuffed toys and hand puppets. Bibaminis, Sabine Reckwerth, Loheide 93, 48346 Ostbevern, Germany; Tel. +49 (0)2532 7803, e-mail: bibabaeren@aol.com, Internet: www.bibaminis.com - Hand-crafted miniatures for decorating pharmacies, shops and the whole doll's house, jars in different sizes and designs. Boom-Miniaturen, Hubert Boom, Zijlstralaan 31, 5251 SE Vlijmen, The Netherlands; e-mail: lhboom@ziggo.nl, Internet: www.boom-miniaturen.com - Handmade cupboards and furniture from antique designs, big assortment of exclusive wood for DIY purposes. Bünnig Modellbau, Sabine Bünnig & Heinrich Tondorf GBR, Sabine Bünnig, Ton Hogenbargen 27, 24629 Kisdorf, Germany; e-mail: info@buennig-modellbau.de, Internet: www.buennig-modellbau.de - Lasercut kits scales 1/24 and 1/48, Panpastel-paints, windows, doors, structured boards and MDF houses. Neil Carter, 10 North Street, Raunds, Northamptonshire NN9 6HX, England; Tel +44 (0)1933 389478, e-mail: njandtcarter@ntlworld.com, Internet: www.neilcarterminiatures.com - Replicas of bronze statues and figurines in Art Déco and Art Nouveau, modernity, Renaissance and Egyptian style, cast using the lost wax process. Luise Christian, Hütteldorfer Straße 157, 1140 Wien, Austria - bobbin racks, haberdashery, Christmas miniatures, all handmade from own workshop. Cinderella, Silvia Leiner, Pwyll y Broga, Pontfaen, Fishguard SA65 9TY, Great Britain; Tel. +44 (0)1239 821074, e-mail: SBLeiner@aol.com, Internet: www.cinderellaminiaturen.com - Dressed and undressed pocelain dolls, sewing material, sewing patterns, drapery, lace; oil paintings and furniture painted by Gabriele Leiner; Lasercut-kits for toys and small pieces of furniture by Dragonfly, USA. Cinen Miniature, Carlotta Rossi, Via della Salute 21/2, 40132 Bologna, Italy; Tel. +39 (0)347 9442364, e-mail: info@cinen.it, Internet: www.cinen.it - Furniture and accessories for pubs, bars, kitchens and the dollhouse. Coras Cottage, Cora van der Meeren, Chopinplein 48, 3122 VM Schiedam, The Netherlands; Tel +31 (0)683 539827, e-mail: cvdmeeren@hotmail.com, Internet: www.corascottage-winkel.nl - Handmade quilts and accessories for a little quilt shop, fabrics with small patterns (100% cotton), french lace and silk ribbons. Cri's Mini, Cristina Lissiotto, Via Oriani 11, 10149 Torino (TO), Italy; Tel +39 (0)333 338 6220, e-mail: cristina.lissiotto@yahoo.it - Shabby chic roomboxes and accessoires as well as decorative articles. Daniëlle Design, Irma & Marco Joossen, Pernambucodreef 38, 3563 CT Utrecht, The Netherlands- Tel +31 (0)30 2624801, Fax +31 (0)30 2628917, e-mail: m.joossen@hotmail.nl - romantically dressed dolls, decorated beds and other furniture-arrangements as well as exclusive hydrangea. Petra Daniels, Friedhofstraße 46, 52134 Herzogenrath, Germany - Embroidered goods, e.g. hand-embroidered rugs, pictures and pillows, upholstered seat assemblies and nice accessories from all over the world, as well as especially nice pieces by good miniaturists. Rijswijk ZH, The Netherlands; Tel. +31 (0)70 3474820, e-mail: bernie@dekleinepoppenkast.nl, Internet: www.dekleinepoppenkast.nl - Handmade animals, bears, baby items and lady items. De MiniLaars, Fern Zijlmans-'t Hart, Heuvelakkersestraat 21, 6913 AA Aerdt, The Netherlands; Tel +31 (0)316 248640, e-mail: minilaars@gmail.com, Internet: www.minilaars.nl - Russian miniatures, garden miniatures, ponds, animals, exclusive seasonal accessories. De Pronkkamer, Ingrid Sikkink, Burgemeester van der Schansstraat 56, 4281 LK Andel, The Netherlands; Tel. +31 (0)183 440 944, e-mail: de.pronkkamer@online.nl, Internet: www.de-pronkkamer.nl - High class handmade "I'm Special" miniatures, e.g. silk pillows and towels with antique lace. Big range of baptism dresses and items for babies and toddlers as well as enameled jugs and much more. Derdriu Dolls, Deirdre Wilgenburg, Roosbroekstraat 6, 1982 Zemst, Belgien; e-mail: info@derdriu.com, Internet: www.derdriu.com - Exclusive collectors' quality porcelain dolls, historically dressed, ranging from the Middle Ages to modern times. Diane Meyboom Miniature Artist, Diane Meyboom, Tuinstraat 101, 2921 XJ Krimpen a/d Ijssel, The Netherlands; Tel. +31 (0)642992456, e-mail: contact@dianemeyboom.com, Internet: www.dianemeyboom.com - Miniature oil paintings, old masters' motives, miniature painting utensils. Special showpiece: miniature replica of the rococo-salon "Hôtel de Soubise" at Paris. Domino, Dominique Roche, Adelinde B, 201, Alleé des Ondines, 07500 Guilherand-Granges, Frankreich; Tel +33 (0)687 808586, e-mail: DominoMiniatures@gmail.com - Leather luggage and office accessories. NEW: Elles Miniaturen, Elle Leenders, Hennepstraat 46, 6842 BL Arnhem, The Netherlands; Tel. +31 (0)263811822, e-mail: elles_leenders@versatel.nl - Handmade bears and other plush toys as well as decorative Easterm Halloween and Christmas accessories. Ericson-Miniaturen, Eric Dees, Loosduinsekade 445, 2571 CK Den Haag, The Netherlands; Tel. +31 (0)70 3667026 und +31 (0)6 542 70750, e-mail: ericszon@gmail.com, Internet: http://ericson-minaturen.nl - Furniture from the 1900s until today - radios, television sets, record players, stoves and much more, also available as DIY-kits. Fennicole Miniatures, Nicoline Wintering, Willem Marisstraat 16, 6866 AT Heelsum, The Netherlands; Tel. +31 (0)317 612722, +31 (0)317 316420, e-mail: fennicole@live.nl, Internet: www.fennicole-miniatures.nl - handmade garden decorations, thin tiles with provencial sandstone look, building material. - Glass miniatures for doll's houses and collectors. NEW: Jan Groot, Churchillweg 21, 1314 RB Almere, The Netherlands; Tel. +31 (0)36 5332114, e-mail: jantonnygroot@mail.com - Landscape oil paintings, self designed in the style of the school of Den Haag. Inka Grossé, Endenicher Straße 55, 53115 Bonn, Germany - Tel +49 (0)228 651681, e-mail: i.grosse@netcologne.de - Porcelain dolls dressed in the style of different epoques, exclusive arrangements as well as high-class accessories (many unique articles). Victoria Heredia Guerbós, Calle Los Flamencos no. 10, edif. Los Olivos apt. N° 17, 29018 Málaga, Spain; Tel. +34 (0)615 967184, e-mail: amcastillo10@gmail.com - smallest flowers, plants and little angel miniatures (<1in), nostalgic toy dolls, all unique pieces handmade from Fimo. Houtenkralen.eu, Elleke van Engelenburg, Glanerbrugstraat 35, 7585 PK Glane, The Netherlands; Tel. +31 (0)53 4618784, Fax +31 (0)53 4288426, e-mail: houtenkralen.eu@hotmail.com, Internet: www.houtenkralen.eu - Miniatures and crafting supplies, specialised in natural wooden beads and mini-fabrics. Inge Braak Miniaturen, Inge Braak, Wilhelm-Hauff-Straße 7, Berlin; Shop: Ceciliengärten 18, 12159 Berlin, Germany; Tel. +49 (0)30 8514218, e-mail: IBraak_Miniaturen@gmx.de, Internet: www.ibraak-miniaturen.de - Trader for exclusive miniatures, building elements, tools, wallpapers scale 1:12, 1:24 and 1:144, plastering and a big assortment of haberdashery; Warwick and Phoenix pewter building kits as well as kitchen utensils and wooden ornaments. Inna's Dolls, Inna Rogozhina, c/Victor O'Hayon Tapiero, 6, Adosado 8, Marbella, 29602 Malaga, Spain; Tel. +34 (0)609 415806, e-mail: innavr@hotmail.com, Internet: www.facebook.com/innasdolls - Hand-modelised character dolls and scenarios scale 1:12, all one of a kind. Jogchum's Puppenhäuser und Miniaturen, Jogchum Snoek, Dianalaan 13, 7321 GK Apeldoorn, The Netherlands; Tel. +31 (0)55785 0208, e-mail: info@dejojo.nl, Internet: www.dejojo.nl - Handmade mini-baby dolls, Reutter-porcelain and various other miniatures. NEW: Ester Kleijnen, Gulperplein 7, 6461 HE Kerkrade, Niederlande; Tel. +31 (0)6 23616028, E-Mail: esterkleijnen@outlook.com, Internet: www.ejewies.jouwweb.nl - Finest, feathery crochet works for living rooms and bedrooms, e.g. tablecloths and blankets as well as romantic hand-sewn linen. Kleine Schätze, Kerstin Klaschus, Kleine Weide 17, 23743 Grömitz, Germany; Tel. +49 (0)4562 7939, e-mail: kleineschaetze1@gmail.com, Internet: www.kleine-schaetze.de - handmade edibles and cakes from Fimo, flowers from silk, punched rugs, Christmas miniatures, toys, furred animals with fur from natural fiber. Anne Kröpke, Ohweg 1, 21442 Toppenstedt, Germany - Maritime unique pieces, individual arrangements with miniatures from Thailand as well as floral scenes and miniatures for Easter and Christmas. Kunstmalerei, Joachim Kühner, Mörikestraße 11, 74385 Pleidelsheim, Germany; Tel +49 (0)7144 888 9883, e-mail: kontakt@maler-jo.de, Internet: www.maler-jo.de - Handpainted porcelain, drawings and oil paintings scale 1/12. Le Miniature di Eurosia, Roberta Solari, Via Lenin 40, 00045 Genzano di Roma, Italy; Tel +39 (0)392 336 6579, e-mail: roberta.solari63@gmail.com - Terracotta and hand-painted tiles, Tuscan pots, wire mesh accessories and small furniture for the bathroom, kitchen and garden. Ursula Lempelius, Apfelstraße 5, 33790 Halle/Westfalen, Germany - Tel/Fax +49 (0)5201 10686, e-mail: kulemp@gmx.de - Fine embroideries, bed- and table-linen, nice things for the nursery, embroidery kits and a big assortment of drapery. Le Petit Tricot, Ellen Stumpf-Warner, Professor Teldersstraat 26, 3274 MC Heinenoord, The Netherlands; Tel +31 (0)6 54765313, e-mail: lepetittricot@live.nl - handmade knitting goods following own designs, light-knit fabrics and lingerie as well as yarn and knitting needles. Little Magie, Gerrie Wijnholds, Apollolaan 82 6411 BC Heerlen, The Netherlands; Tel. +31 (0)6 41931812, e-mail: little.magie@outlook.com - small self-made miniatures, crafting materials. Brigitte Lohrmann (Kleines Glück), Harnackring 72, 21031 Hamburg, Germany; Tel. +49 (0)40 7383906, Fax +49 (0)40 344135 - Christmasy and paschal accessories, self-made dolls, mini-mini dolls scaled 1:87 and 1:144, rooms as well as exclusive miniatures from all over the world. NEW: Magazijn Blijdorp, Richard Boot, Stadhoudersweg 97-C, 3039 EC Rotterdam, The Netherlands; Tel. +31 (0)10 466 31 80, e-mail: info@magazijnblijdorp.nl, Internet: www.magazijnblijdorp.nl - Wide range of Proxxon machines and tools by various manufacturers. - Only exhibits on Saturday! Georgia Marfels, Droste-Hülshoff-Weg 2, 49492 Westerkappeln, Germany; e-mail: Georgia.Marfels@rub.de, Internet: www.etsy.com/shop/georgiamarfels - Witches' supplies, small animals, edibles and DIY-articles from metal and glass. Micro-Crochet, Babette Polman, Schipholtstraat 132, 7534 DB Enschede, The Netherlands; Tel +31 (0)644 758074, e-mail: microcrochetbybabette@gmail.com, - Mini-mini figures, crocheted in highest quality, handmade teddy bears. MiKi Buch, Inge und Hans-Otto Kimmling, Tulpenweg 31, 56766 Ulmen, Germany; Tel +49 (0)2676 613, e-mail: miki-buch@t-online.de - Doors and hinges, furniture, shale, wood, bees and beehives by Hans-Otto Kimmling; Books and handmade rugs by Inge Kimmling. Miniature Fashion, Susanna Alberti, Via Bastoni 1, 24021 Albino, Bergamo, Italy; Tel. +39 (0)347 7046377, e-mail: susy.alberti@gmail.com, Internet: www.miniaturefashion.etsy.com - Brautkleider, Korsetts, Hüte und Taschen sowie Accessoires im Landhausstil. Miniaturen-Flechtatelier, Rosie Kohl, Taubenstraße 30, 73650 Winterbach, Germany; Tel. +49 (0)7181 44595, e-mail: miniaturen-flechtatelier@t-online.de - Wickered goods: baby carriages, strollers, beach chairs, garden furniture, baskets etc. scaled 1:12, 1:24 and 1:48 as well as hospital furniture. Miniaturen Schneider, Thomas Schneider, Yorckstraße 12, 80637 München, Germany; Tel. +49 (0)89 12391370, Fax +49 (0)89 12391481, e-mail: tschneider@miniaturen-schneider.de, Internet: www.miniaturen-schneider.de - Finest handmade Fimo minatures, mainly edibles, all self-made. Miniatur Puppenwelt Wengen, Monika Mayer-Lübeck, Lindauer Straße 22, 87480 Wengen, Germany; e-mail: info@miniatur-puppenwelt.de - selected miniatures from A like apple to Z like zinc tub - everything scaled 1:12. Mini-Flora, Irene Gerhardt, Holbeinstraße 3, 63322 Rödermark, Germany; Tel. +49(0)6074 95387, Fax +49(0)6074 95357, e-mail: I_Gerhardt@web.de - Miniature floristry and supplies, cut flowers and bridal bouqets. Mini Modern Style, Angela Paola Ribatti, Via Galimberti 6, 10080 Bosconero (Torino), Italy; Tel +39 (0)347 2928437, e-mail: info@minimodernstyle@gmail.com, Internet: www.facebook.com/minimodernstyle - Furniture, accessories and textiles for modern interiors. Minipot, Lisbeth Pedersen, Romlundvej 1, 8831 Løgstrup, Denmark - homemade pottery and other decorative small miniatures. minis2you, Marie Creutz, Bygatan 11, 577 36 Hultsfred, Sweden; Tel. +46 (0)70 540 3109, e-mail: minis2you@telia.com; Internet: www.minis2you.etsy.com - Ice skates and roller skates, clogs, baby shoes and shoes for ladies and gentlemen, suitcases and briefcases - all handmade from real leather, as well as jeans and dolls. M. Nieves, M. Nieves Mergelina Sánchez, Calle Rio Jarama, 483 (Las Colinas), 19170 El Casar (Guadalajara), Spain; Tel. +34 (0)949 335148, e-mail: m.nieves.artesana@gmail.com, Internet: www.m-nieves.com - Unique character dolls with real glass eyes and carefully hand-sewn clothing, as well as accessories: paintings, porcelain and small scenes, all unique handmade pieces. My Thai Miniatures, Maureen Gestman, Rudolf Garrelsstraat 106, 1443 LK Purmerend, The Netherlands; Tel. +31 (0)299 648369, e-mail: maureengestman@hotmail.com - Miniatures from Thailand as well as handmade flower arrangements. My Tiny World Ltd., Paul Duckett, Unit 22 Ross Road, Northampton NN3 2SP, England; Tel +44 (0)1604 589818, e-mail: sales@mytinyworld.co.uk, Internet: www.mytinyworld.co.uk - Range of over 10.000products including extensive range of handmade glass, food, wooden and airdried clay items. Poupée Tendresse, Ingeborg Riesser, 2, sq. Racan, 75016 Paris, France; handmade exclusive miniatures from France, England and the USA as well as French trade magazines. Puppenstuben & Miniaturen, Andrea Dewald-Schneider, Breite Straße 91, 42369 Wuppertal, Germany; e-mail: email@miniaturen-versand.de, Internet: www.miniaturen-versand.de - Furniture and decorative accessories by all well-known brands as well as exclusive crocheted miniatures. Leo Reijnders, van Maerlantstraat 14, 5671 VM Nuenen, The Netherlands; e-mail: l.reijnders@onsnet.nu - Hand-crafted glass miniatures for household, doctor's office and laboratory. R en J Miniaturen Speelkwartier, Ria & Jorien Vroege, Sclaavenburch 25, 3131 MB Vlaardingen, The Netherlands - Hand-crafted miniatures for equipping babies, beaches, toys and miniatures for bathroom and kitchen, also: accessories for dog owners. Specialty: Accessories with designs by Beatrix Potter. Roselind Raabe - Volkskunst und Spielwaren, Roselind Raabe, Dübener Straße 2, 04509 Delitzsch, Germany; Tel. +49 (0)34202 51374, Fax. +49 (0)34202 51372 - Doll's houses, doll's house furniture, various miniatures scaled 1:12, electrics, flowers, carpets and wallpapers, crafts supplies, Christmas and Easter decorations. Tel +39 (0)340 7463410, e-mail: patisan@alice.it, Internet:www.patriziasantiminiatures.com - handmade shoes, boots, bags and accesories as well as nicely decorated furniture. Sara's Miniaturen, Henk und Ria v.d. Woude, Bosboom Toussaintstraat 42, 3141 CA Maassluis, The Netherlands; Tel +31 (0)10 5916203, e-mail: ajvdw@telfort.nl - Luxurious ladies' articles, lingerie, beauty cases, decorated linen cupboards, flower arrangements and small pieces of furniture, all handmade. Scarletts zauberhafte Miniaturen, Manuela Herbst, Messingstraße 34, 38642 Goslar, Germany; Tel. +49 (0)5321 330995, e-mail: familieherbst@t-online.de, Internet: www.etsy.com/de/shop/Scarletts45 - Accessories for the elegant lady, playful knick-knacks for babies and stylish supplies for witchy gals. Hans-Jürgen Seitz, Tübinger Straße 26, 74172 Neckarsulm, Germany; Tel. +49 (0)7132 81680, Mobile +49 (0)173 3735442 - Metal miniatures, e.g. cookers and ovens, metal fittings, door hinges, tree stands and articles for melting tin - all handmade. e-mail: engelhard.schmitt@telar-verlag.de - Delicate silhouette miniatures as well as silhouette greeting cards, for sale in favour of the Straßenkinderhilfe e.V. Schweinfurt, Martin Luther-Platz 3, 97421 Schweinfurt - Demonstrations at the table! Christel Schneider, Jägerhaus 66, 42287 Wuppertal, Germany; Tel. +49 (0)160 6306160 - Exclusive Asian miniatures; manifold assortment from own stock as well as handmade pieces. cold cuts and meat specialties, baked goods, fast food, fairground dreams and Bavarian specialties. Stella Que Passa, Stella de Bruijne, Westvierdeparten 8, 8391 XS Noordwolde, The Netherlands, Tel. +31 (0)561 430303, e-mail: stellaquepassa@online.nl - Brick compunds, moulds, fimo cutters, DIY-kits and food, many pieces also available scale 1:24. Susan Bembridge Designs, Susan Bembridge, 88 St James Road, Bridlington, East Yorkshire YO15 3PQ, England; Tel. +44 (0)1262 676951, e-mail: susan@susanbembridgedesigns.com, Internet: www.susanbembridgedesigns.com - Fine wallpapers, printed silks and cottons, printed wood, stone and marble floorpapers scales 1:12 and 1:24. The Little Dollhouse Company, Maria Fowler, 612Mt Pleasant Road, Toronto, M4S 2M8 Ontario, Canada; Tel +1 (0)416489 7180, e-mail: maria@thelittledollhousecompany.com, Internet: www.thelittledollhousecompany.com - Trader for exquisite collector's quality miniatures from Canada, the USA and all over the world. The Mini Factory, Lida v.d. Reep, Het Kaar 98, 5571 RV Bergeyk, The Netherlands; Tel. +31 (0)497 575810 - Fimo-edibles and bridal wear, books, furniture, dolls, chicken coops, everything you need in the garden and much more. The Minishop, Bertram Stoecklein, Buchbinderweg 29 b, 12355 Berlin, Germany; Tel +49 (0)30 6641371, e-mail: Minishop-Berlin@gmx.de - Flower arrangements, paschal miniatures, Christmas trees, Christmas decorations, ponds, tools, lamps, LEDs and electrical supplies as well as furniture. Tiny Ceramics, Rita Kruger, Im Silbertal 5, 56203 Höhr-Grenzhausen, Germany; Tel. +49 (0)2624 9418060, e-mail: info@tinyceramics.de, Internet: www.tiny-ceramics.com - Ceramic wall- and floor-tiles, enamelled and un-enameled (1.5mm thin, various forms), hand-painted picture-tiles - Commissions welcome! Troll Factory, Rainer Habekost, Kaiserdamm 2, 27339 Riede, Germany; Tel +49 (0)172 2698657, e-mail: info@trollfactory.de, Internet: www.trollfactory.de, www.formenkontor.de - Specialized trader for silicone caoutchouc, "Alginate", plaster, latex milk, silicone and resin for model making as well as supplies and advice for appropriate mold design and construction. Ulli's Puppenstube, Ulrike Wockauer, Falkensteinstraße 1, 94577 Winzer, Germany; Tel. +49 (0)9901 94772, e-mail: info@ullis-puppenstube.de, Internet: www.ullis-puppenstube.de - Accessories and small pieces of furniture from own workshop, needlework supplies and tools. NEW: Unicorna, Trees Beertema, Noorddijkerweg 23, 1645 VC Ursem, The Netherlands; Tel. +31 7250 23235, e-mail: trees.beertema@planet.nl, Internet: www.unicorna.nl - Marble plates and tabletops, elaborately draped textiles for decorating a solid and stylish dollhouse as well as a wide range of fabrics, lace and ribbons. Jan van den Doel, Musselweg 78, 9584 AG Mussel, The Netherlands; Tel +31 (0)6 20054299, e-mail: janvandendoel@gmail.com, Internet: www.winkelplein.nl/janvandendoel - Exclusive plants, flowerst and garden supplies from own manufacturing, hand-painted ribbons and quilting supplies, supplies for miniature floristics. Pierre van den Heuvel, Gieterijstraat 12, 6001 MV Weert, The Netherlands; Tel. +31 (0)6 10605303, e-mail: p.v.d.heuvel54@hotmail.com - Handmade furniture from different periods, inspired by original designs and own concepts. Rinus & Lony van Leeuwen, Jaarsveldstraat 162, 2546 CT 162 S. Gravenhage, The Netherlands; Tel. +31 (0)702207850, +31 (0)31648759230, e-mail: Lony51@hotmail.com - Asian furniture from bamboo and bound rattan. Vilia Miniature, Lia Comugnero, Via San Rocco 1/6, 20060 Vignate (MI), Italy; Tel. +39 (0)3357689611, e-mail: viliaminiature@gmail.com, Internet: www.viliaminiature.it - Unfinished furniture scale 1:12 and 1:24, DIY-kits and accessories, all handmade items. Wagon Mountain Studio, Godelief Janssen, Heidehof 14, 4921 GA Made, The Netherlands; Tel. +31 (0)624 273771, e-mail: noldien.janssen@planet.nl - Hand-painted Hindeloop furniture and home accessories following historic examples from the 16th through 19th century. Wieser-Miniaturen, Walter Wieser, Dickebankstraße 24, 44149 Dortmund, Germany; Tel. +49 (0)231 173150, e-mail: WalterWieserDo@aol.com - Fimo edibles as limited-lot productions and one of a kind pieces from own manufacturing as well as wallpapers. Jaap Wijtenburg, Zdl. Parallelweg 214, 6812 BZ Arnheim, The Netherlands; Tel. +31 (0)26 445 7385 - Hand-painted miniature oil paintings following own designs in the style of the old masters (all unique pieces) - commissions welcome! Natasja Woord, Wijk 7-15, 8321 VK Urk, The Netherlands; Tel. +31 (0)527685574, e-mail: natasja.woord@gmail.com, Internet: www.creahobbynl.blogspot.nl - Handmade miniatures from wool: bears, toys and dolls. ZUS & ZO Miniaturen, Marike Schenning, Prins Hendrikstraat 139, 3151 AE, Hoek van Holland, The Netherlands; Tel. +31 (0)625 193 350, e-mail: marikeschenning@online.nl, Internet: www.miniwebwinkel.nl/winkel/zusenzominiaturen - Hand-thrown unglazed and glazed ceramics, some of it decoratively painted.